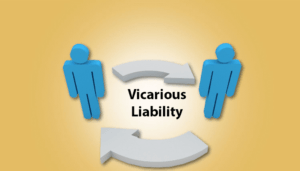 Vicarious liability is a legal term used to explain the legal responsibility one party may hold for actions that cause harm, even if they aren’t the party that directly caused the harm. Also sometimes referred to as imputed liability, vicarious liability states that any party who is into an authoritative legal relationship with another party is legally responsible if their actions cause harm to the other party. One of the most common examples where vicarious liability comes into play is in the workplace. The company – the employer – is vicariously liable for the actions, words, and deeds of its employeesLabor MarketThe labor market is the place where the supply and the demand for jobs meet, with the workers or labor providing the services that the employers demand. The, specifically when the actions, words, or deeds are conducted in the name of, or on behalf of, the company. It is true when the company or one of its employees either intentionally or unintentionally causes harm. Harm could be done to a fellow worker/employee, a client, or even a collaborative company and its employees. Employers are often unaware that they can be held liable for the actions of one or more of their employees. Even if the employee(s) is held directly responsible for the actions that cause harm, the employer may be found vicariously liable as well. Unless there is undeniable proof that the employee(s) acted without the knowledge or consent of the employer, or that the negligent behavior was done outside of the employee’s terms of employment with the employer, the employer can be, and often is, found vicariously liable. A significant amount of gray area exists surrounding what constitutes “harm.” In certain instances, actions may be taken that cause harm to the clients or customers of a company. Third-party vicarious liability can occur if it can be proven that a client or customer was caused harm in the name of, on behalf of, or under direction from, the company in question. It’s important to note that an employer can still be found vicariously liable for an employee’s actions even after the departure of the offending employee. There’s also a substantial amount of gray area surrounding when vicarious liability should, and does, end. Vicarious liability exists outside of the employee/employer relationship, including in areas such as the medical field and business partnershipsJoint Venture (JV)A joint venture (JV) is a commercial enterprise in which two or more organizations combine their resources to gain a tactical and strategic edge in the market. Companies often enter into a joint venture to pursue specific projects. The JV may be a new project or new core business. On a much smaller scale, someone who owns a vehicle is vicariously liable for the actions of any individual whom they permit to operate their vehicle. The fact is that vicarious liability is designed to keep individuals and larger parties accountable and make sure that someone or some entity is held responsible for harm caused to the innocent. The reality is that vicarious liability – and all the gray areas within it – can lead to sometimes frivolous, ridiculous, and unfair legal recourse for employers, companies, or relatively innocent or unknowing parties. Contingent LiabilityContingent LiabilityA contingent liability is a potential liability that may or may not occur depending on the result of an uncertain future event. The relevance of a contingent liability depends on the probability of the contingency, its timing, and the accuracy with which the amount associated with it can be estimated.